The village is full of restaurants serving typical local Swiss specialties prepared in the same way a century ago and all supporting a gourmet’s idyll of using fresh local produce. In addition with its links via the Gotthard Pass, the region has been strongly influenced by Italian cuisine as well as many other exotic and international dishes are available. The Club House was opened by The Chedi Andermatt in Winter 2015. With its relaxed and uncomplicated atmosphere, and its unique location at the centre of the lowlands of the Urseren Valley, the Club House is a perfect destination. Enjoy views of the mountains from the sun terrace in both winter and summer. The Gasthaus Ochsen has long been renowned for its wonderful fondues. Be part of this tradition and choose between the classic cheese fondue and other interesting variations as well as many other culinary treats. 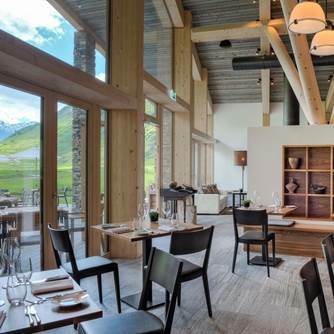 The menu at the Gasthaus zum Sternen in Andermatt includes both Swiss and local Uri dishes. The restaurant menu includes a range of rösti and tarte flambée. Cheese fondue and raclette also feature on the menu and can be enjoyed with a glass of fine wine. The menu at the Hotel 3 Könige & Post is noted for its regional and international specialties. As you dine in the tastefully appointed Goethesäli at the restaurant you will be transported far from the stresses of everyday life to a place where time seems to stand still. At the Gasthaus Skiklub choose from an extensive range of Uri specialties and Swiss cuisine including cordon bleu, veal liver, rösti, various cheese fondues and candlelight raclette. By prior arrangement, the Skiklub can also serve fondue Chinoise and fondue Bourguignonne. Enoteca 1620 is a wine shop and drinking place that sell and serve first-rate, great-value wine. Their wines come predominantly from Italy and Mediterranean Europe, from varied regions, largely made by small producers of notable quality and character.